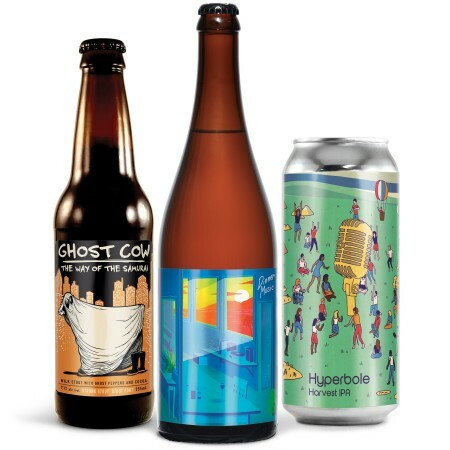 GUELPH, ON – Wellington Brewery has announced details of three new limited edition beers due for release later this month. First up will be Dinner Music (4.5% abv), “a snappy golden ale fermented with a special brettanomyces yeast blend in a neutral oak barrel” that will be released in 750 ml bottles on Friday October 12th. Next in the line is Ghost Cow: The Way of the Samurai (7.1% abv), a variant of Wellington’s Chocolate Milk Stout that features “loads of cocoa flavour and a spicy pepper blend including scotch bonnet, habanero, and ghost peppers!” It will be available Wednesday October 24th in 355 ml bottles. Wrapping up the trio will be Hyperbole Harvest IPA (6.1% abv), a collaboration with Guelph Spoken Word for the 15th Annual Canadian Festival of Spoken Word. It’s been “brewed with an armful of fruit and vegetables including pumpkin, rhubarb, grapefruit, and peaches,” and will be out in 473 ml cans on Friday October 26th. All three beers will be available exclusively at the Wellington retail store and online shop while supplies last.